In Oaxaca, Mexico, A Locally Made Soda Takes Aim At Coca-Cola's Supremacy : The Salt Oaxacan restaurants are offering diners an alternative to the ubiquitous Coke by selling Zega-Cola, an artisanal soda made in small batches nearby. Its maker hopes that will translate into local jobs. Carpenter Antonio Ambrosio Salvador makes Zega-Cola in Santa Ana Zegache, a small village near Oaxaca, Mexico. Zega-Cola was conceived as a locally made alternative to Coca-Cola, which is ubiquitous in Mexico. In the sunny colonial city of Oaxaca, Mexico, diners at the upscale restaurant Los Danzantes might notice their fellow patrons drinking a brown, carbonated soda. It looks like Coca-Cola and it tastes — almost — like Coca-Cola. But Coca-Cola it is not. It's a drink called Zega-Cola, an all-natural substitute to the ubiquitous soft drink. It's made in the nearby village Santa Ana Zegache, and these days, many Oaxacans are clamoring for it. Its creator, a carpenter named Antonio Ambrosio Salvador, sold more Zega-Cola last month than in his entire first year of production. Mexico is notorious for its love of Coca-Cola and other sugar-sweetened soft drinks, which has been cited as a major factor behind the country's high rates of obesity and diabetes. The country's Coke consumption is actually going down, thanks to a soda tax implemented in 2014, but "decline" is relative in this case: In 2015, the World Economic Forum found that Mexico was still the second-highest per capita consumer of sugary drinks in the world. Zega-Cola's fans want to provide consumers in Oaxaca with an alternative to this omnipresent drink. On March 1, the owners of Los Danzantes, a guidebook staple often cited as one of the region's chicest restaurants, announced via social media that it would stop selling Coke products entirely in favor of Zega-Cola. "Nobody talks about the countless consequences that this gaseous beverage has on the human body and on the world economy by eliminating healthy competition," says the Facebook post, which has more than 2,000 reactions and 3,000 shares. Now, when diners at Los Danzantes order Zega-Cola or ask about Coke products, waiters present them with a note card explaining the switch. Los Danzantes owner Jaime Muñoz says this embrace of Zega-Cola fits perfectly with his restaurant's mission to uphold all things Oaxacan. "Part of the philosophy of Los Danzantes is to enhance our roots in Mexican cuisine with local products, and it is time to make decisions that are more consistent with our philosophy and to support and promote local and natural products as much as we can," says Muñoz. Zega-Cola is made a mere 18 miles away from Oaxaca, in a workshop in Santa Ana Zegache, an agrarian Zapotec village where sheep ride in the backs of trucks, fuchsia flowers and cacti line the quiet streets, and the public trash cans are made of glued-together Coke bottles. Salvador first got the idea for Zega-Cola three years ago. He's part of an artisan collective called Proyecto Zegache. Sometimes, visiting foreigners teach the collective various skills, and in 2015, an Australian visitor offered a class on soda-making. "It all stemmed from curiosity," says Ambrosio Salvador. "What was the recipe like? How can you make your own beverage? More than anything, we were all curious." After the class, Ambrosio Salvador and nine other collective members had an idea: Why not use soda-making to keep money and jobs in Santa Ana Zegache? They started production, but there was one problem: They didn't make any money. The other collective members jumped ship, but Ambrosio Salvador, his wife, Eufemia Cruz Benito, and his 14-year-old daughter kept trying. Zega-Cola is packaged as a concentrate, in glass 250-milliliter bottles with instructions on how to turn the concentrate into a soda. A crate of Zega-Cola contains 24 250-milliliter bottles of concentrate, which produces 48 liters of soda. At first, Ambrosio Salvador only sold six of those crates per year. Then restaurants started getting involved. "In 2016 there were problems of supply of Coca-Cola products and because of that, we decided to change Coca-Cola for Zega-Cola and people started to know the product and accept it," says Andrea Sánchez López, co-owner of Oaxaca's El Tendajón Agaveria, where she now sells about 10 liters of concentrate per month. "One of the things we also decided was to support a product made in Oaxaca." Mezcal bar La Mezcalerita also started selling Zega-Cola, and now, of course, so does Los Danzantes. In February, Ambrosio Salvador sold six crates, which works out to 288 liters of soda and 4,320 pesos, or about $230. In Santa Ana Zegache, the average per capita monthly income is about $260. Since Los Danzantes publicly declared its support for Zega-Cola on Facebook, demand has jumped – with more than five crates sold in just two weeks, Lizeth Velasco, administrator of the Proyecto Zegache, told Mexico's Expansion recently. Ambrosio Salvador spends the week on his carpentry job, and usually devotes Sundays to making Zega-Cola in a periwinkle-painted room decorated with ornate wooden frames and a poster of the town's 17th-century painted church. First, he mixes seven oils, including cinnamon, lavender, orange, lime and lemon. He uses a mortar and pestle to pound Arabic gum, then mixes everything together in a blue pot. "We don't use a whisk, we use a carpenter's drill because it's more powerful. And the ends of the whisk wouldn't work with our drill, so we had to fashion our own," says Ambrosio Salvador. He adds citric acid and caffeine, plus caramel for color. These ingredients can be hard to find in Oaxaca, and sometimes he has to wait weeks before getting his hands on them. Ambrosio Salvador says the value of Zega-Cola, for the buyer, lies in its transparency. If you drink a bottle of Zega-Cola, you know exactly what you're drinking, and you know it's all-natural. But is it local enough? That's the question the owners of La Miscelánea, a shop that sells locally made products, asked themselves recently. They sold Zega-Cola for two years — until two weeks ago, when they found out that Ambrosio Salvador had gotten the idea from a foreigner and buys his ingredients from outside the state. "That is kind of sad because it's kind of a fraud," says Victor Castañeda, co-owner of La Miscelánea. 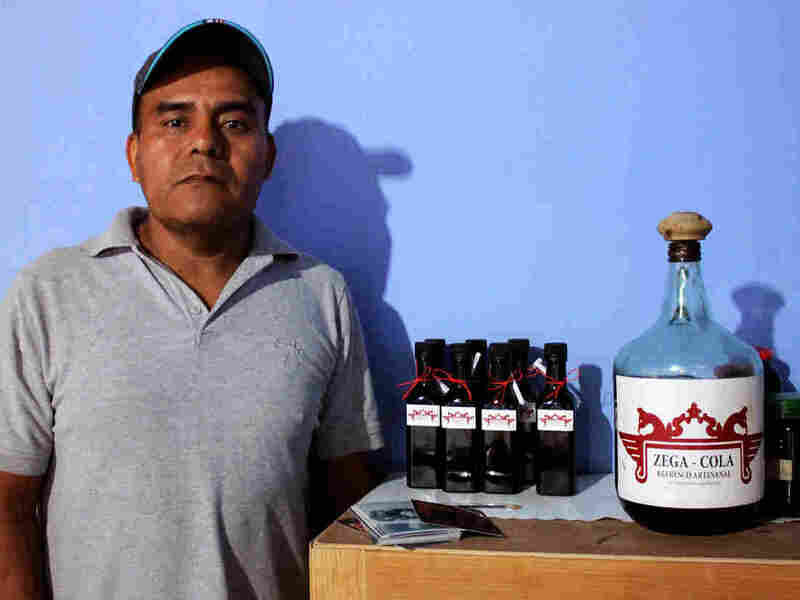 "There are a lot of producers in Oaxaca that can make the ingredients that are used for Zega-Cola, but no, they are still buying this essence for this company abroad. ... Where is the local?" He adds, "We think that Zega-Cola could be a really good product if they find a way to make it completely Mexican." For restaurateur Andrea Sánchez López, though, the fact that Zega-Cola is made in Oaxaca is enough. "Zega-Cola is not a Oaxacan product because the ingredients are imported, but it is made by Oaxacan hands. This is why we continue to support [it]," she says. As for Ambrosio Salvador, his goal is simple: keep money and jobs in his village, which loses swathes of its population to the United States every year. He hopes that someday, he can hire helpers from the town and teach the art of Zega-Cola to Santa Ana Zegache's children. "My dream for Zega-Cola is that it can be a source of employment for us, for my family, and for people to learn the trade," Ambrosio Salvador says. Emily Cataneo is a journalist and fiction writer currently based in Raleigh, N.C. She's on Twitter @emilycataneo.